Our contributors fill you in on two "can't miss" soon-to-be Dividend Aristocrats, and one company that's still decades away, but could be the best future Dividend Aristocrat to buy today. Dividend Aristocrats have proven to be great long-term growth investments. Image source: Getty Images. Dividend growth stocks often make some of the best investments, and the vaunted "Dividend Aristocrats" are no exception. This list includes more than 50 S&P 500 companies that have paid -- and increased -- their dividend for 25 consecutive years, and many of those companies have been life-changing investments for shareholders who managed to hold them for decades at a time. We asked three of our contributors to write about the next Dividend Aristocrats. There are several within reach, including General Dynamics Corporation (NYSE:GD) and Praxair, Inc. (NYSE:LIN), both of which will be recognized as such within the next year. But one of our contributors took a different approach and wrote about Mastercard Inc (NYSE:MA), a company that's still 20 years shy of making the cut but could be the best potential future Dividend Aristocrat to buy today. 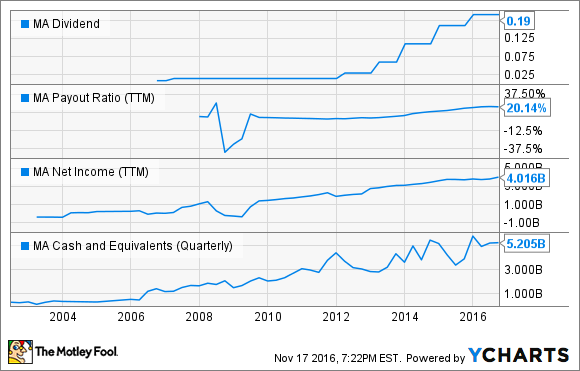 Want to learn more about these great dividend growth stocks? Keep reading. Dan Caplinger (General Dynamics): There aren't many sure things in the dividend world, but one fact is that General Dynamics is just about guaranteed to be the next Dividend Aristocrat. Earlier in 2016, the defense giant boosted its dividend payout for the 25th consecutive year, giving investors a raise of 10% to pay $0.76 per share each and every quarter. Once the company behind the Dividend Aristocrats index does its annual reconstitution in January 2017, General Dynamics should officially become part of the elite list of dividend stocks. One secret to General Dynamics' long-term success has been its ability to create earnings growth even during tough conditions in the defense industry. For instance, in its most recent quarter, General Dynamics saw its overall sales fall 3%, missing expectations for a slight gain on the top line. Yet even with that revenue pressure, the defense giant managed to boost its profits by 8% by taking advantage of opportunities to improve margin, and it also raised its guidance for the remainder of the year. Between its aerospace, marine systems, combat systems, and information systems and technology units, General Dynamics has a lot of potential to keep delivering victorious results for shareholders long after it becomes a Dividend Aristocrat. Jamal Carnette, CFA (Praxair): I'm going to answer this question quite literally by selecting Praxair. The industrial gas supplier has paid and raised its dividend every year since 1993, making 2017 the 24th consecutive year of increases. At the announced payout of $0.75, Praxair has increased its dividend payout at an annualized rate of 11%, much higher than inflation during that period. Praxair has continued to outpace inflation, with its last dividend increase of 5% coming in at more than twice the Consumer Price Index inflation figures. Unfortunately, Praxair's strong dividend history has not translated to stock market success recently. Excluding dividends, the stock is up just 14% from its price five years ago, while the S&P 500 has returned approximately 66%. The company's fortunes are tied to cyclical manufacturing, metals, and energy industries, with these industries accounting for approximately 55% of Praxair's revenue. Furthermore, Praxair's sales are heavily tied to the North American market, which has recently struggled in the wake of low oil and other materials prices. As a result of Praxair's underperformance, shares currently trade at a price-to-earnings ratio of 22 with a dividend yield of 2.6%. Versus the S&P 500, shares of Praxair are 10% cheaper while yielding 45 basis points higher on account of analysts' subdued outlook on the company's growth. In the event you're expecting a turnaround in materials and manufacturing, however, Praxair may be a reasonably valued pick for income-hungry investors. Jason Hall (Mastercard): Dan and Jamal cover the two companies in line to become the next Dividend Aristocrats. But I'm going to take a different approach and write about a company that I think has an excellent shot to make it to the vaunted club in another 20 years: Mastercard. Dividend Aristocrats are attractive investments because they have strong records of increasing their payouts, and have historically been a market-beating group. Mastercard's combination of opportunity, profitability, and margin of safety for its current dividend make it everything an investor would want in a dividend growth stock. MA Dividend data by YCharts. As you can see, the company has steadily grown its profits, and as electronic payments -- still a tiny share of global transactions -- grow along with the world's middle class in coming decades, those profits are likely to continue increasing. Furthermore, the company only paid out 20% of last year's profits in dividends, giving it plenty of room to grow payouts sustainably for many years to come. So if it's dividend growth you're after, don't restrict yourself to just the current Dividend Aristocrats. Mastercard today presents an excellent opportunity to buy a likely future member of the club and benefit from some of its best decades of growth.